Can you imagine how many football club chairman there were around the country today giving Charlton envious glances? 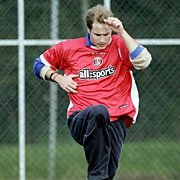 What a public relations coup for the club having the 2nd in line to the throne running around Sparrows Lane with the players in a Charlton kit. Even Allsports' worth must have gone up?